Sea Spirit in the Lemaire Channel, Antarctic Peninsula. Last week’s announcement by Hurtigruten celebrating the 50th anniversary of its vintage vessel MS Lofoten reminded me of the longevity of expedition ships, and of the market niche that loves them. The company has a storied 120-year history of transporting both locals and international tourists along the Norwegian coast, as well as offering expedition cruises around Svalbard and, in more recent years, to Antarctica. While most passengers nowadays opt for Hurtigruten’s somewhat larger and newer ships, the 150-passenger Lofoten clearly appeals to a niche of the market with her classic nautical lines, wood paneled interiors and intimate atmosphere. She's created a real identity for herself, and for those looking for something a little different. There are many other small, vintage vessels that still ply the remote corners of the globe, catering to adventurous travelers. I hope to blog about a few more of them in the future, and how they’re marketed. For now, I want to sort out a fleet of 25-year-old sister ships that do their fair share in taking curious travelers to out-of-the-way destinations on expedition cruises. I figure I’m not alone in trying to remember what happened to the eight original small ships built and operated by the now-defunct Renaissance Cruises. Who operates them, and where are they? It’s a soap opera of sorts, but with small ships instead of people playing the roles. Original Renaissance Cruises generic postcard. Most in the industry associate Renaissance with its later fleet of eight, much-larger vessels, built between 1998 and 2001. These ships are still going strong, too, albeit under a variety of owners and operators. But by the time Renaissance filed for bankruptcy in 2001, the earlier fleet had been sold or chartered off several years prior. Apparently, Renaissance management felt the business model for the smaller vessels wasn’t scalable, and wanted to focus on the newer R-Class ships that carried 680 passengers each. Another generic Renaissance Cruises postcard. Give out generic postcards of generic ships on generic itineraries and you get generic passengers. Hint: Not a good idea. Create some identity that passengers can relate to! Renaissance’s early-'90s marketing pitch with these first-generation vessels was affordable luxury and glamorous yacht destinations in the Mediterranean, Northern Europe, Caribbean and the South Pacific. Critical to the company’s original business plan were the generous subsidies offered by the Italian government in order to maintain shipyard employment at Cantiere Navale Ferrari-Signani in La Spezia, which built Renaissance I through IV, and at Nuovi Cantieri Apunia in Carrara, which built Renaissance V through VIII. The two sets of vessels were built about the same time, with minor differences: the first four accommodated 100 guests, were 88.3 meters long and weighed in at 4,077 GRT while the second set would carry 114, were 90.6 meters long and tipped the scales at 4,200 GRT. Oddly, they were given no names aside from their numerical ones. Visually, the two pairs differed in that the mid-decks on I-IV have walk-around promenade decks whereas V-VIII enclose this space resulting in some slightly larger passenger cabins and public areas. Cosmetic, technical and mechanical upgrades – such as ice strengthening on several vessels – were also made over the years. Renaissance I-IV also featured wing-style or flared exhaust stacks that were left off of Renaissance V-VIII. Dubawi (currently) purchased by the UAE Royal Family and converted into a super yacht by Platinum Yachts of Dubai. No wonder EasyCruise went out of business. With those colors, how did you sleep at night? CruiseOne (currently) but it may be converted into another super yacht by Platinum Yachts of Dubai. 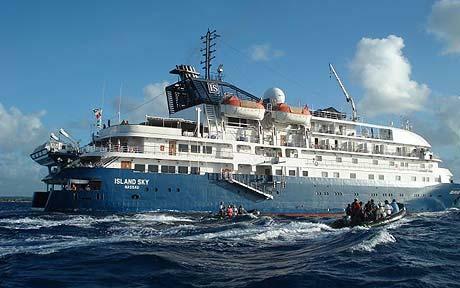 Silver Galapagos (currently) by Silversea Cruises, offering year-round cruises in the Galapagos Islands. 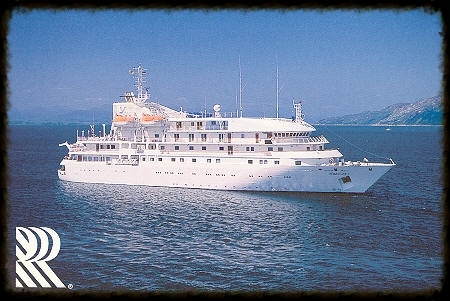 Corinthian (currently) by Travel Dynamics, including programs in Antarctica, African coast and Europe. The ship has a Lloyds 1D ice rating. Corinthian, in her current Travel Dynamics livery. Sea Spirit (currently) by Quark Expeditions, with programs in the Arctic and Antarctica. The vessel was modified in late 2010 with ice strengthening and other mechanical upgrades; she has a Lloyds 1D ice rating. The Caledonia Sky is currently roaming the Pacific, from Papua New Guinea to the northern Kamchatka Peninsula. Caledonia Sky (currently) by Noble Caledonia, with worldwide programs. Sea Explorer (currently) by Polar Latitudes and Poseidon Expeditions with programs in Antarctica; and Quark Expeditions with programs in the Arctic. The ship has a Lloyds 1C ice rating. Island Sky (currently) by Noble Caledonia with worldwide programs. So, six of the original eight Renaissance small ships are now fully engaged in the adventure cruise market. As someone who has marketed destination-oriented, small-ship cruising for most of his career, I'm happy to see this. Of course, I don’t want to hide the fact that several of these vessels served as gambling and party ships in the Far East for a short time. Hopefully, those days are gone for good. The Island Sky, currently operated by Noble Caledonia. Join her in Cuba, the Azores, Iceland, Black Sea, White Sea or the Seychelles. And that's just this year! I find it ironic but not surprising that the real market value in these vessels today, with a couple of exceptions, isn’t based on sensory onboard pleasures, perceived glamour and fashionable, jet set ports-of-call. Instead, most of them are making their mark in taking curious travelers to destinations that are otherwise difficult to get to: the Galapagos, the high Arctic and Antarctica, the Black Sea, Papua New Guinea and other locales around the globe, many of them places without the mass-market buzz promoted by large cruise ship operators. Granted, the accommodations and decor provided on these Renaissance ships are a bit more refined, an improvement in comfort and layout compared with a few of the older research vessels and ferries that had been converted in the past for expedition cruising. But there is a strong similarity in other respects. The heart and soul of these ships is now in discovery, providing their passengers with the Four Es that I’ve written about previously: Education, Enrichment and Entertainment, all of which lead to the bigger E, Engagement. Focusing on the Four Es in turn builds brand loyalty, repeat customers and great prospects. It’s all about promoting the destination, and leveraging the expedition ship's assets – including the human assets; i.e. the field guides, educational staff and naturalists – as the best way to experience it. With small ships, it's vital to create a niche, do something unusual and unexpected, a strategy pointed out by Marketing Strategist David Meerman Scott in a blog post a few weeks back. "A true leadership position comes from serving those who avoid the default position. Do something that enriches other peoples' lives." I welcome your comments on this topic, and please don't hold back if I've made a mistake or two with the many past incarnations of the vessels in the original Renaissance fleet. Let me know! Postscript: I updated the status of these vessels in an August 2014 post. No doubt, things will change again!